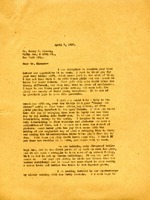 A letter from Henry T. Sloane wishing Martha Berry luck for Commencement week. 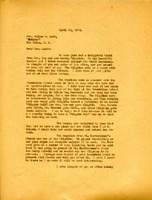 Martha Berry tells Ladd about the visit by the Pilgrims and the gift commitments they made. 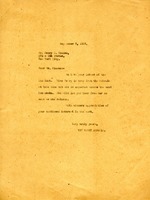 Berry says that the boys are delighted with the photograph Ladd sent of herself for Lemley Hall, but that she is jealous and wants one for herself. A list of contributors from the Birthday Luncheon who are not on Mrs. Hammond's list. 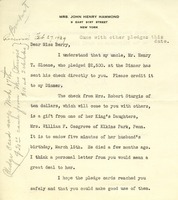 Berry Birthday Dinner, Emily Vanderbilt Hammond, EVH, Henry T. Sloane, Robert Norwood, Valentine Macy Jr.
Letter from The Berry School to Mr. Henry T. Sloane in receipt of his letter and informing him that Miss Berry is away. 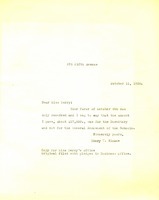 Martha Berry thanks Mr. Sloane for a gift he gave to the Berry Schools that helps the girls. She invites him to come visit, and talks about the majesty of the campus. Miss. Berry sneakily drops hints about wanting bells for her silver anniversary with the schoolss. 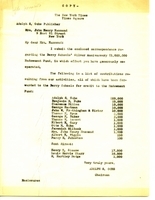 Mr. Sloane specifies the donation he gave to the rebuilding of the Dormitory and not to the General Endowment of the Schools. 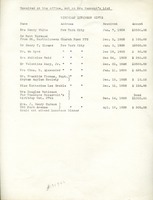 Adolph Ochs is sending Mrs. Hammond a list of the contributors to the Silver Anniversary $1,000,000 Endowment Fund, which includes names and the amount each person gave.